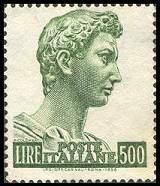 The most popular of the legends that have grown up around him relates to his encounter with the dragon. A pagan town in Lebanon was victimized by a dragon (representing the devil), which the inhabitants first attempted to calm down by offerings of sheep, and then by the sacrifice of various members of their community. The daughter of the king (representing The Church) was chosen by lot and was taken out to await the coming of the monster, but George arrived, killed the dragon, and converted the community to Christianity. Italy 1976. Painting by V. Carpaccio (c. 1455-1526), showing the dramatic killing scene. The painting belongs to the Vatican. Some historians claim that the Ptolemaic Temple of Edfu in Egypt probably shows the origin of St. George's Legend in the bas-relief of "Horus riding and killing Seth, the unknown animal". The fact remains that he is also a Muslim saint and the Patron Saint of Palestine; there is not one town in costal Palestine that doesn't have either a church dedicated to St. George, or a mosque dedicated to Al-Khadr, the latter being his Muslim name. Saint George has been adapted world wide as the saint fighting the evil and defending the good, in the end (always) slaying the evil dragon. As mentioned above he is a Byzantine martyr, and the patron saint of many countries and cities, particularly in Eastern Europe. 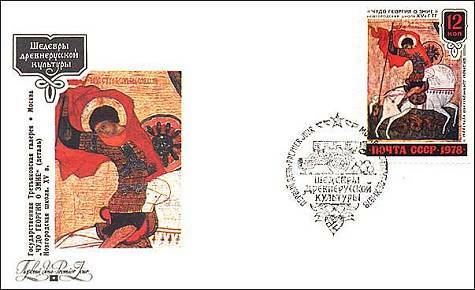 First Day Cover from Russia 1978, The stamp features a Russian St. George Icon, of the Novgorod School (17th century). St. George is the patron saint of Moscow He is also the patron saint of the scouts, and his feast day 23rd April is celebrated throughout the world by the scout organisations. Romania 1939. Romanian semi-postal for the benefit of the Romanian Scout Organisation. Germany 1961. 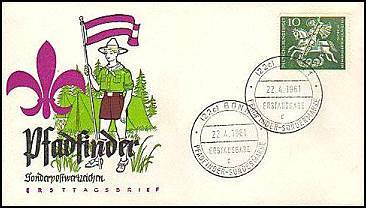 FDC issued at the occasion of the 50th anniversary of the Germany Scout Organisation. Last, but not least, St. George is the patron saint of Great Britain. In 1222 the Council of Oxford ordered that his feast on April 23 be celebrated as a national festival, and in the 14th century he became the patron saint of England and of the Order of the Garter, despite the absence of any historical connection between him and England. Great Britain 1998. Se-tenant strip issued in the honour of the 650th anniversary of the Order of the Garter. This strip is also known as "The Queen's Beasts". England 1990. The George Cross (from the set of Gallantry Awards, issued 11th Sept. 1990). The George Cross is awarded to civilians for outstanding acts of bravery. The medal shows St. George slaying a dragon (as depicted on gold sovereigns) and bears the legend 'For Gallantry'. It is the civilian equivalent of the Victoria Cross which is awarded to members of the armed services for conspicuous acts of bravery and bears the legend 'For Valour'. These two crosses are the nation's highest awards (by the sovereign) and are given only very rarely. Holders of these crosses are entitled to put the letters GC (or VC) after their name, and these take precedence over all other honours and qualifications, whether awarded by The Queen (or King) or not. It is easy to remember that the GC is for Gallantry, and the VC for Valour.